What is being billed as Europe’s first permanent bunker station for liquefied natural gas (LNG) bunkers will open in June, says PitPoint.LNG. Located on the Rhine in the port of Cologne, the facility will service the inland shipping market. 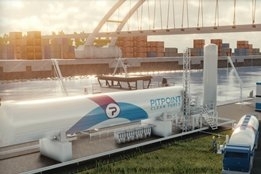 “With the construction of this bunker station, we are taking a major step towards realising our goal of facilitating cleaner transport over both roads and waterways,” says Jan Willem Drijver, Managing Director of PitPoint.LNG. Interest in LNG bunkers has been growing steadily in recent years thanks to tightening emissions regulations on marine fuel.